It is replaced by the Symbol LS 1908 Cobra. 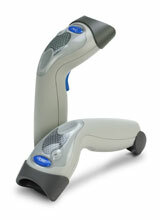 The QS3500 Handheld Laser Scanners offer powerful scanning in an ergonomic and innovative design. The QS3500 is a triggered handheld scanner, available in decoded and undecoded versions. With multiple interfaces (RS-232, Keyboard wedge, Wand Emulation, and USB) on board, you will be able to connect easily to a variety of PCs and terminals. You'll also be able to configure your scanner to your particular needs with Advanced Data Formatting. and with flash memory, you'll be able to upgrade your scanner with the latest product updates. Backed by a five-year warranty, the QS3500 provides excellent durability and reliability. With a five-foot drop specification and wide operating temperature range, the QS3500 will perform well in a variety of applications. Triggered RS-232 kit. Includes RS-232 cable, power supply & stand. Triggered scanner. Order cables separately. See accessories.